Today is a fun card using the Fringe Scissor. I got inspired by Lydia Fiedler. 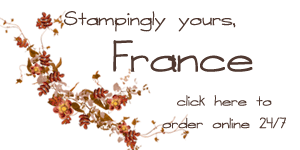 So for our stampin’101 I will cover the basic of the Fringe Scissor in the video on my blog at www.frenchiestamps.com. Here are the color that I use for this card, starting from the bottom going up. Just add the greeting and in my case use some butterfly simple that become a WOW card. Till next time Happy Creating. Have a wonderful day! LOVE THIS! We just did a blue one like this today at my clubs, it was a HIT! (Will post later) I will have to send my peeps to your blog to see another version. THANKS FRENCHIE! What a neat effect. Makes me think of flapper style dresses. If we noticed your SU awards we could deduct you had been doing this longer than 6 months. Miscommunication was kinda comical! But the card is creative and lovely. France, these came out great. I agree with Marlene, it DOES remind me of flapper dresses, also. Great video. TFS! Fringe makes a unique card. Great idea. Again another beautiful card. I just over looked the French scissors because I didn't know how to use them. Thanks to you and the video I will take another look at the scissors. You make everything look so easy. Also like the view out your craft window and the card you made like it. Have a good week. When I first saw these scissors, I thought why would anyone want these. Now I see why. I love the look of the Ombre. I haven't seen it in any color or sentiment I didn't think was great! Love these cards! Thank you for your creativity!